The earth can be compared to an old-fashioned watch in that it has a numerous moving pieces that are fully integrated. These “systems” are mid-bogglingly complex and include our oceanic system, atmospheric system, soil system, fresh water system (including the hydrologic cycle, which of course overlaps with the atmospheric system), climate system, etc. Each of these systems is fully intermeshed with all the other systems, just like in a watch. In practical terms, what this means is that when we see some aberration or decline on one system, we can know that all the other systems are equally impacted, whether it is obvious and measurable or not. We can also infer that when we see a massive change in one system, we will in fact see massive changes in other systems in response to this change. The earth is in a dynamic state, with new and significant events always triggering other new and significant events. In sum, declines in earth’s systems spur ever larger and more rapid declines. This process of earth’s accelerating decay and the implications for other systems is on display in the North Atlantic right now, and it is getting a fair amount of attention from the type of people who study earth’s systems. It is also starting to get some significant outside attention, including this recent article in the Washington Post. The article looks at changes in the Gulf of Maine and, toward the end of the article, looks at the broader context. It is the broader context that is most interesting. And within that broader context, it is the entanglement and accelerating decline of earth’s systems that is most interesting, so lets look at that. Below is a graphic from Climate Reanalyzer at University of Maine. The graphic is the visual representation of data from literally thousands of sources (sea buoys, satellites, land stations, etc.). This graphic shows variations from the norm in ocean surface temperature. Tan, brown and copper are increasingly warmer than normal, while baby blue, deep blue and purple are increasingly cooler than normal. 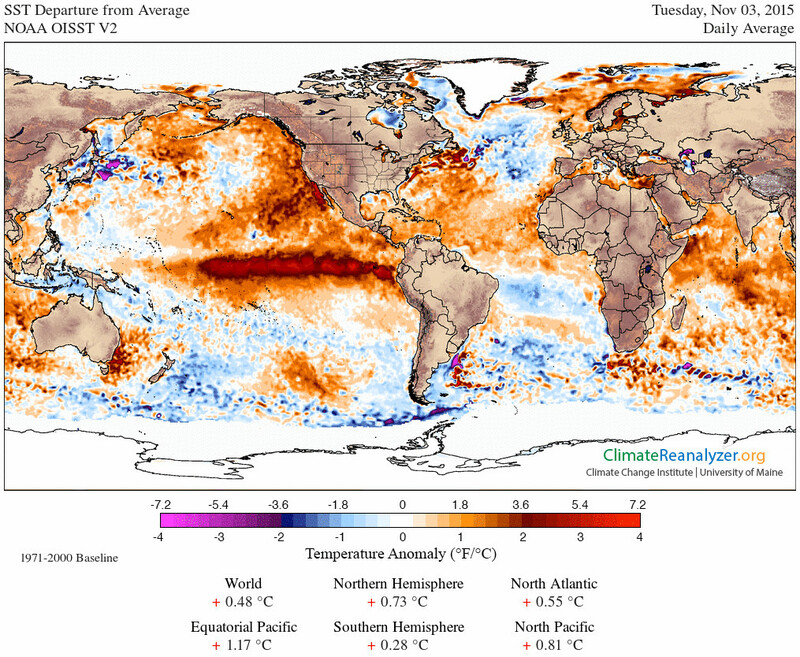 Looking at this graphic, the most dominant feature is the current strip of really, really warm water stretching from the middle Pacific to the west coast of South America. This is what an El Nino looks like. And that collection of warm water is sufficient to change global weather patterns because, yes, all of earth’s systems are intermeshed and what is going on with water temps in the equatorial Pacific influences just about every other system on earth. However, it is not actually the current massive El Nino that this post is about. Switch your attention from the Pacific to the North Atlantic. Off the east coast of the United States you will see that some significant warm water has built up, extending even to Maine (here, “warm” is relative – while the water is warmer than normal, the water off the coast of my home state of Maine is sufficiently cold that you don’t want to go swimming in it in November). Further north and east, you will see a blue “cool pool” (or “cool blob” as scientists are calling it). It is this cool pool that we’ll focus on. The Washington Post article toe-dances around just where this cool pool came from. They do this because scientists think they know, but cannot conclusively prove (to the standards of science), where the cold water came from and how it is interacting with other systems. Still, the working hypothesis is fairly straightforward: we are seeing astonishing rates of melt off of Greenland, and all that water is “fresh” which is to say it is not salty. Such massive amounts of fresh water, when drained into the North Atlantic, do not in fact completely mix with the salt water. Instead, it forms a layer of cold brackish water that sits on top of the heavier salt water and spreads out over a huge area. Now, people who don’t observe the earth are going to say, “So what?” After all, what is the big deal about a whole lot of fresh, cold water draining from Greenland’s melting glaciers? Well, there are a lot of things happening as a result, and each of them is a big deal. First of all, the melt water disrupts the Atlantic Meridional Overturning Circulation (AMOC). The AMOC is essentially a conveyor belt in which really warm, really salty water from the Caribbean flows to the edge of the arctic region (warming England and Norway and Iceland along the way) and then sinks to the bottom of the ocean and continues on a complicated and global course. What happens here is that, as surface water in the Caribbean flows north, it evaporates and becomes saltier and heavier. However, because it is heated by the sun and quite warm, it does not sink. As the water flows north, it is pushed by the flow from the Caribbean but it is also pulled by the end of the conveyor belt near the arctic. This is because, when this water gets to near the arctic, it cools quite a bit and then it is both heavier and colder than the water around it and it promptly sinks, pulling the water behind it along. When the massive flows of fresh water from Greenland come along, two things happen. First of all, they block AMOC’s way, making it harder to flow to the edge of the arctic. Second of all, the lighter fresh water is pulled up to replace the sinking AMOC water, depriving the remaining current of some of the power that was moving it. The net effect is that the northern end of AMOC slows down, even while the southern end doesn’t. Right now, there is a “bulge” of water off the eastern coast of the US which is up to eight inches higher than normal as AMOC gets increasingly backed up (yes, water does “bulge” over large distances). This bulge of water is also quite warm, and parts of the Gulf of Maine have been up to 10 degrees (F) warmer than normal, which has decimated some fish populations and sent lobsters scurrying north, resulting in (what will be short-lived) record catches in the area. The Washington Post article does a good job covering this aspect if you are interested. Now what we are seeing is that the ocean has bulged about as much as it can and AMOC is beginning to slow down. What this means is that really, really warm surface water in the Caribbean is moving out of the area more slowly, and the whole area is heating up as a result. Whether the record drought in the Caribbean at the moment is a result of AMOC or El Nino or some combination of the two is unknown. But we do know the water in the area is heating up, and this means a multitude of long-term changes including more energy available for hurricanes when they do happen. And because the hot water extends so far north, we have more fuel for hurricanes as they track north, so they will be stronger, longer, and that is bad news. Another impact we are seeing from the cool pool is severe storms pounding the UK. Essentially, they were getting strong winter storms in the late summer and through the fall. We are likely to see more and stronger storms as a result of hot water and cold water pools so close together. This “”dipole” is essentially a cradle for storms. As winter sets in and Greenland again becomes completely frozen, the outflow of fresh water stops (or at least slows) and warming trends reassert themselves. We can see that in the graphic above, with the tan and copper tint to the water around Greenland indicating warmer-than-normal water. We can also see a dappling of tan across the cool pool, as bits of the AMOC have recently been successful in fighting their way through the fresh surface water. It is likely we will see more of this as winter sets in. It is equally likely that Greenland will melt at an even faster rate next year, racheting up the process we have discussed and setting off even bigger reactions in all the other systems. Let’s track this through: We see changes in our atmosphere, which in turn trigger melting in Greenland’s glaciers. This outflow of fresh water breaks through and backs up a north-bound current. This in turn delivers cold temperatures and storms to Northern Europe. It also delivers drought and increased temperatures (and sea life die-offs and greater storms) to the Caribbean as well as sea-life die-offs and flooding to the US east coast. These are some of the impacts we know of. It is likely there are others we know little of (what is the effect on the rest of the global sea current when AMOC slows down?). It is important to remember that the earth was created in perfection, and stayed that way until sin entered the world. When sin entered the world, Satan overcame and conquered man and usurped the dominion which God had given man. The Bible says that Satan is the “god” of this world and in fact his powers are awesome and wide-ranging, though not absolute (praise God!). Satan has sufficient power to set up his administration of the earth and try to prove his charge against God — that God is not fair and that Satan has a better way. So far, as indicated by death and suffering on earth, Satan’s system of “survival of the fittest” and a selfishness-based order is an abject failure. Of course, this does not prevent Satan from attempting to blame God for everything Satan has caused. Christ said that this age, when things were really falling apart and nearing their end, would come to an end. He gave us signs to look for as an indication that the age was coming to an end. He gave us these signs in Matthew 24, along with the exhortation to watch, watch, watch. Christ said that when we saw these things happening, we were to “look up, lift up your heads, because your redemption draws near” (Luke 21:28). And this is the encouraging thing about what we are seeing. Yes, the earth is falling apart. It is the irreversible effect of sin and it is why God is so opposed to this fatal disease. Yes, we are seeing suffering and sickness and conflict increase the world over. It is the net effect of sin. But at the same time, there is an end, and that end is very, very near. This is all the reason any child of God needs to focus on the work at hand. Because even though time is short, and even though sin and evil almost completely predominate, there are still those who will turn to Christ and ask Him to save them from this mess. As long as there are people who will change their course, Christians need to be there offering to help them. Our near-term future is clear and, yes, it is difficult and grim. But equally clear (and almost as close) is our long-term future, and it is everything that we lack here – peace and happiness and delight. We just need to stay focused on our tasks and wait on the Lord, for He is coming soon enough.